Journal of Emergencies Trauma, and Shock (JETS) is the official journal of INDUSEM. 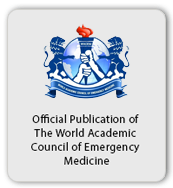 It is also the Official Journal of The World Academic Council of Emergency Medicine and the OPUS12 Network. JETS encourages research, education and dissemination of knowledge in the fields of Emergency Medicine, Traumatolgy and Shock Resuscitation thus promoting translational research by striking a synergy between basic science, clinical medicine and global health. Investigations with human subjects are a result of knowledge obtained from basic research with genes, cells or animals, which is then translated into diagnostic or therapeutic interventions that can be applied to treatment or prevention of disease. The mission of bench to bedside research is to translate the basic science discoveries into clinical applications and to use the clinical observations to generate research foci for basic science. JETS will encourage the promotion of such novel research. Basic scientists need to have an understanding of the realities of the human condition. Without that intersection between basic science and the clinic, discoveries made at the research bench may have little relevance or application to the real-life human situation and developing effective therapies. These findings later have to be applied to mass populations; hence, the role of public health research is vital. Trauma, Emergency and Shock research have their foundations in basic laboratory science. Translational research is the process of applying ideas, insights and discoveries generated through basic scientific inquiry to the treatment or prevention of human disease. This currently is the most dynamic and active area of the scientific discipline. In 2005, "better translation of findings into patient care through guidelines" was at the top of the list of seven research priorities of the CDC updated Acute Care chapter of the 2002 agenda. Our Editorial Board has been meticulously chosen from experts around the globe and spans from areas of pre-hospital care, toxicology, trauma care, basic sciences, simulation technology, medical education and critical care to encompass the neonatal, pediatric and geriatric age groups. JETS will publish scientific contributions such as Original Articles, Review Articles, Case Reports, Case Series, Clinical Trials, Clinical Investigations, Interesting Photographs, Radiology and EKGs and Expert Commentaries. The journal is peer reviewed and indexed. Article Submission and Peer Review is fully Online and Web Based. Mark Sanborn in his article "The marks of distinction" emphasizes the need for growing oneself in order to grow the people around you. The resultant success flows from the ability of leaders and their team. He further makes a point that this growth should be channelized to offer and achieve excellence in areas, which are distinctive. We Believe and State that JETS Aims for Distinction ! The INDO-US partnership exists at many levels and in many areas. In the field of Emergency Medicine and Trauma this collaboration is an academic effort between University of South Florida in the United States and All India Institute of Medical Sciences in India. The partnership enjoys the support of the World Association of Disaster and Emergency Medicine. Today the Partnership has spread to partners around the world who also constitute the OPUS12 Network and The World Academic Council of Emergency Medicine. The main mission of this partnership is to foster the growth of academic medicine in the fields of Emergency Care and Traumatology. The collaborative promotes exchange of knowledge and mutual development between Academic institutions across the world.